It's November 22 and after today, NaNoWriMo participants have just eight days to hit the 50,000 word mark before the 2011 competition comes to a close. Judging by the word counts I've seen on Twitter, a lot of people are cracking along nicely. Now, I posted a while back about how I was intending to write short stories for my Parrots & Piracy project. 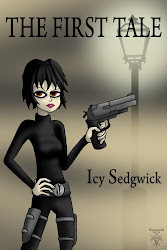 I got about 1600 words into the first story, in which Captain Scarlight and Methuselah encounter the dastardly highwaywoman Lizzie Quinn, and then I totally lost interest in what I was doing. Unfortunately, I need to be in the right frame of mind to write my Parrots & Piracy stories and right now, I'm not. Too much has surfaced in the dreaded Real Life and I just haven't been able to fit it in. I know people will cite the importance of a structured writing plan or schedule but sadly things aren't always so cut and dry. So I'm putting the stories to one side until I'm in a better state of mind to work on them. 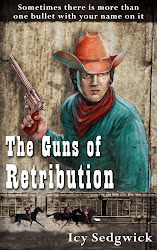 More importantly though, I've been more concerned with working on the sequel to The Guns of Retribution - I'm more excited about writing that, so my priority has been to get the outline finished. While the first book was a pulp Western about revenge and comeuppance, the second one is more of a supernatural tale that pits Grey O'Donnell against forces more savage than a cruel sheriff. I don't have a title yet but I'll keep you posted as to my progress. I did a post over on Write Anything about NaNoWriMo and how to defeat the detractors, but what I'm interested in is how is everyone else getting on with their novels? My NaNoWriMo is about 8k words behind, but I'm not taking the word count thing super seriously. Given that, I'm actually impressed with myself that I've gotten so much written and in a manner that I don't think will need much of a massive overhaul to turn into a readable story. 8k behind is still a massive achievement, and even if you don't finish, you've still gotten a whole chunk of work finished. I salute you, sir! College homework (four literature classes) took me out early in the month---I am going to attempt to finish it when the semester is over. I didn't participate, so I'm just cheering on those who are.